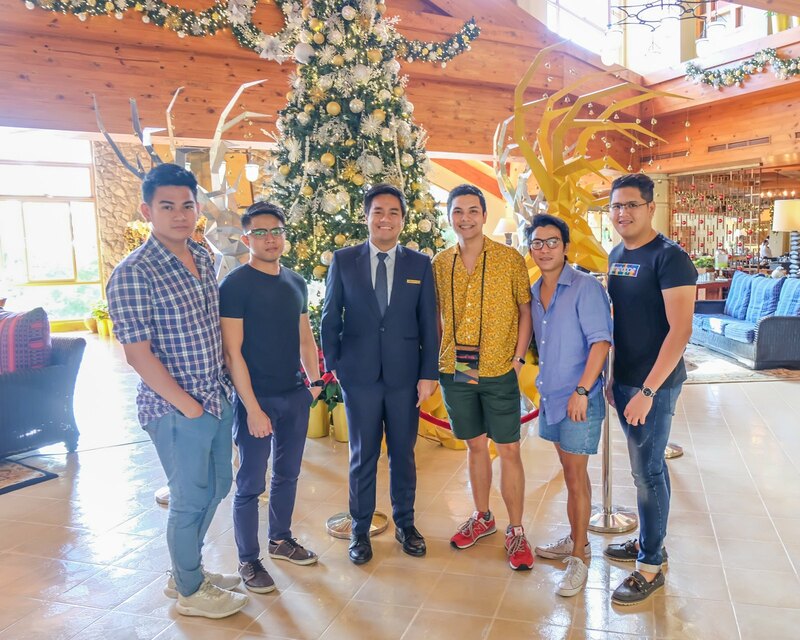 I’ve been to Baguio City a number of times, but never set foot at Camp John Hay (IDK why lol), Now we’ve been given an opportunity not just to visit Camp John Hay, but also to stay at one of Baguio City’s premiere accommodation provider, my colleagues and I didn’t miss any chance to enjoy, savor, and make memories in the wintry City of Pines. 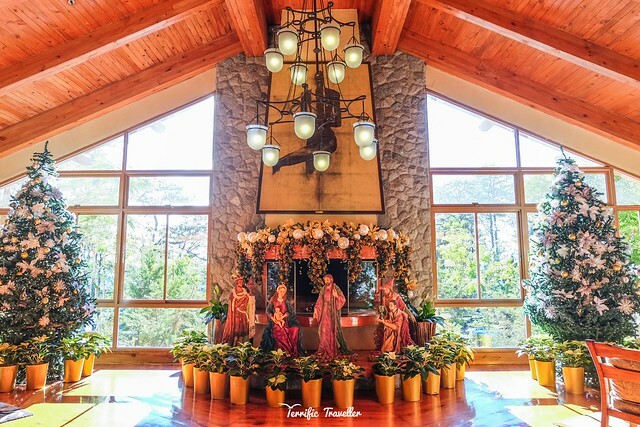 The Forest Lodge at Camp John Hay sits on a sprawling area inside Camp John Hay – away from the big-city hustle and bustle of downtown Baguio. Here, one can enjoy the rare cool temperature in the middle of a pine forest which forms part of Baguio City’s watershed. Nature lovers can take time to bask in the romantic sunsets and indulge in a casual stroll along quiet, tree-lines roads on what used to be an American military recreational camp. 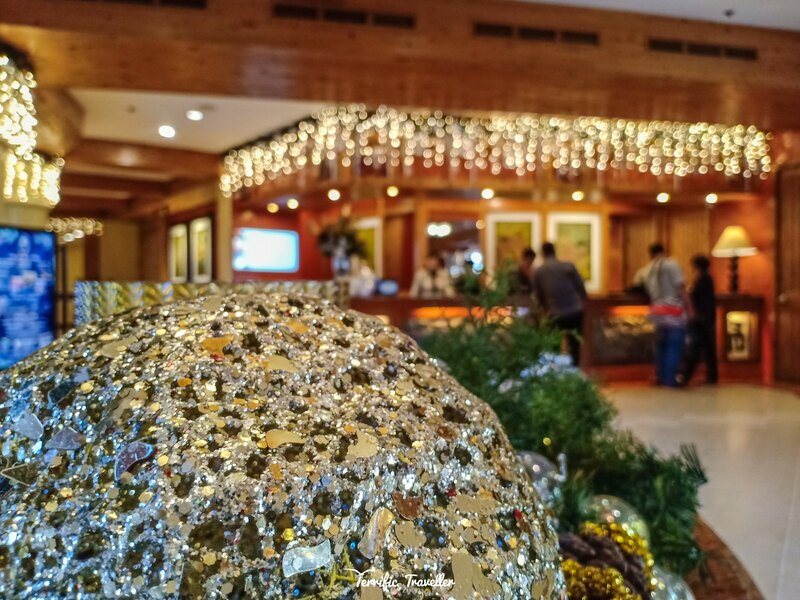 Note: This article will focus on our stay at The Forest Lodge this holiday season, hence all the decors and posts about Christmas you’re about to read and see. Let’s start the tour! It took us less than 20 minutes via regular cab from Session Road to The Forest Lodge. The path we took gave us breathtaking views of Baguio’s Pine Trees, chilly fresh air, and modern developments. The massive lodge’s facade (veranda setting) you see above serves as a function hall called 19th T for all kinds of events. Talk about making a first impression eh? Grand, Just grand. That’s what my colleagues and I all said upon entering the lobby. 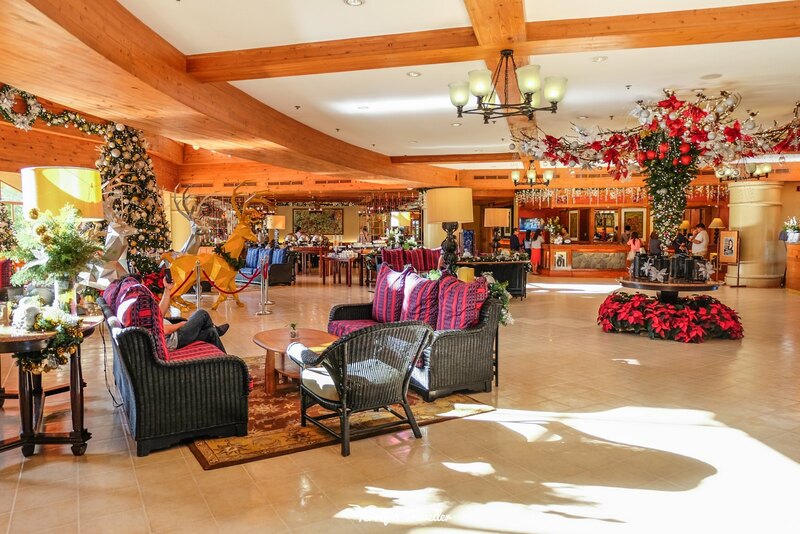 We were all awestruck with the hard work of setting up the lobby with elaborate Christmas decors, comfy lounges, and beautifully crafted reindeers! 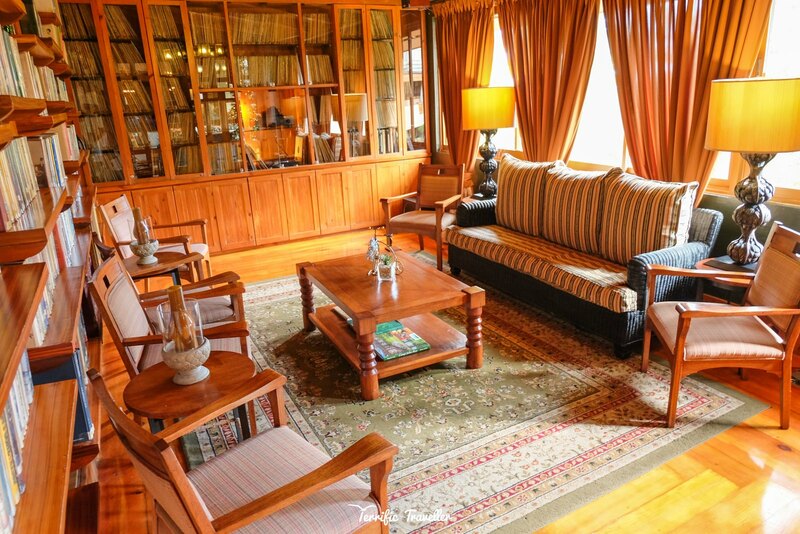 The whole ambiance exudes luxury for all guests. 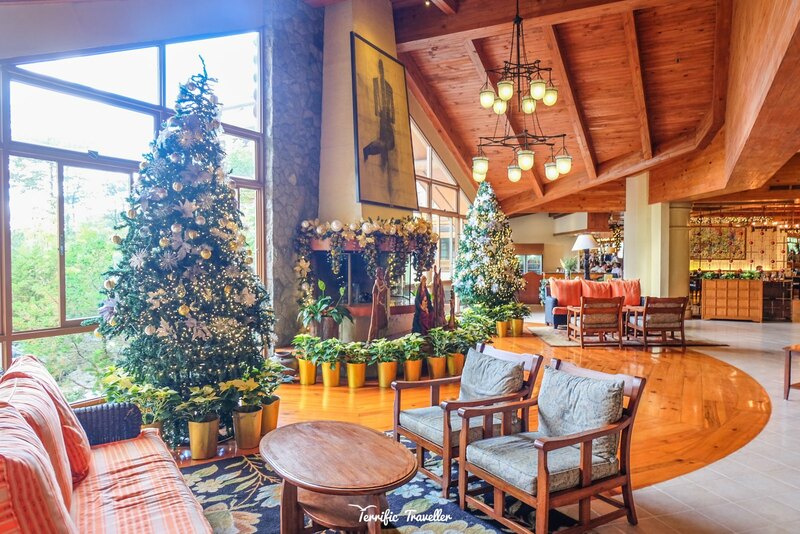 The warm and cozy feel of The Forest Lodge begins at the airy and spacious lobby where the modern paintings and tribal décor provide color. At the far end is a fireplace where guests can huddle and enjoy the toasty blaze on cold and rainy nights. 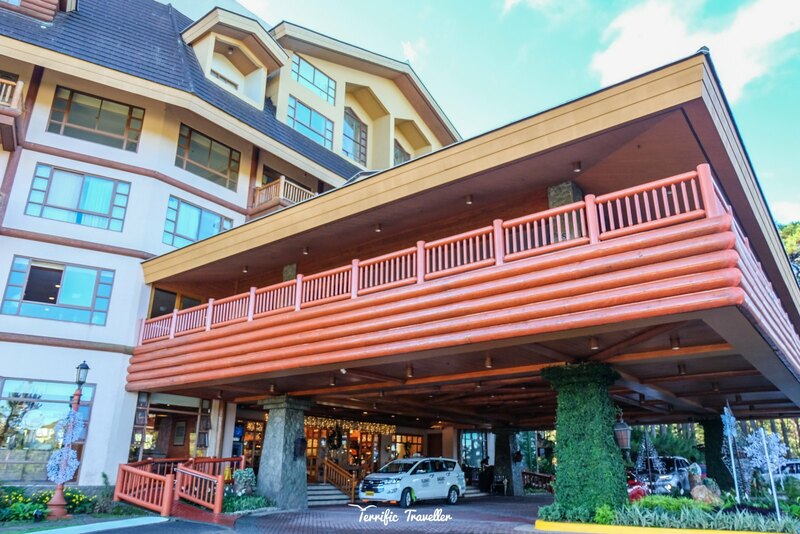 The hotel’s log cabin design fosters togetherness, bonding and the traditional Baguio hospitality. We arrived a little bit early for check-in, so I decided to explore and take snaps of a few corners within reach at the lobby. 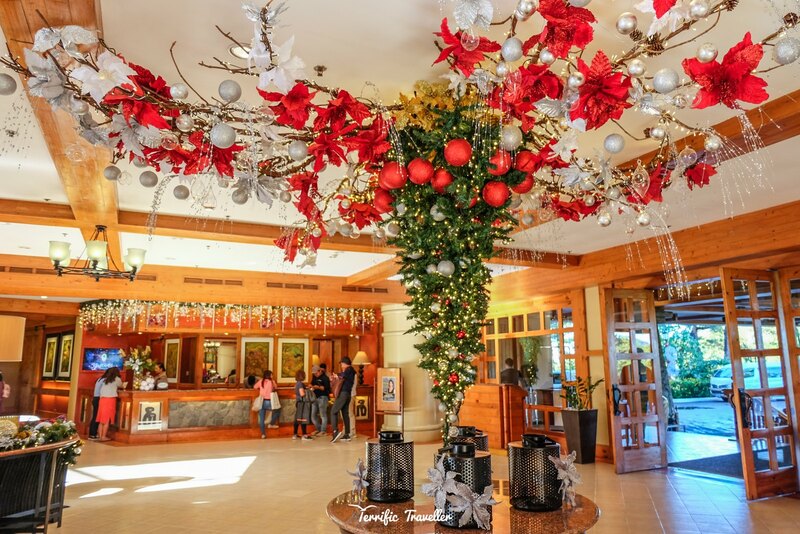 Here you see a Christmas ornament and the Front desk. Above is the Music Room. Reminisce rock & roll, ballads, groove music of the 50’s to the 90’s with over a thousand vinyl records from these decades available for solo lounging, or hanging out with friends. You can also book this room for private meetings or events. 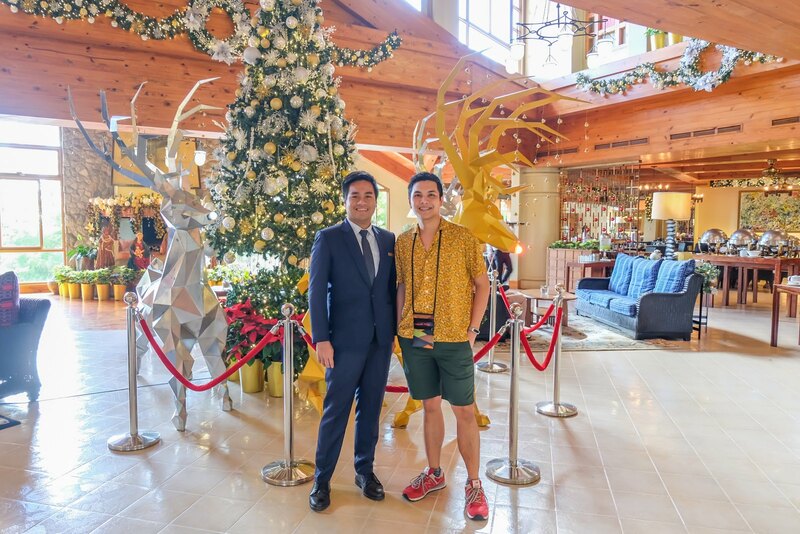 Above you see me (right) and Mr. Ross Jake Bautista – Assistant Front Office Manager of The Forest Lodge at Camp John Hay. Mr. Bautista is the key person who communicated with me in planning and executing our memorable staycation in Baguio City. We are joined by my colleagues (lucky for me, I have colleagues who all love travelling! – and we all have the same rest days lol) who all played a key role in making sure this staycation becomes one of the most memorable ones. (L-R) Axel Teneza, Ezekiel Garcia, Mr. Bautista, Yours truly, Efraim Agapito, and Wilbert Berboso. 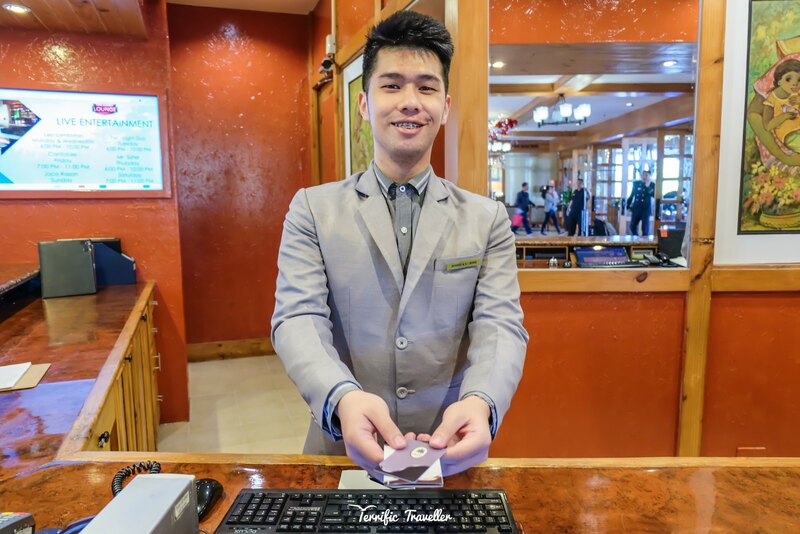 This photo was captured prior to check-in, as Mr. Bautista wanted to make sure that everything’s in tip-top condition before we head up to our room. 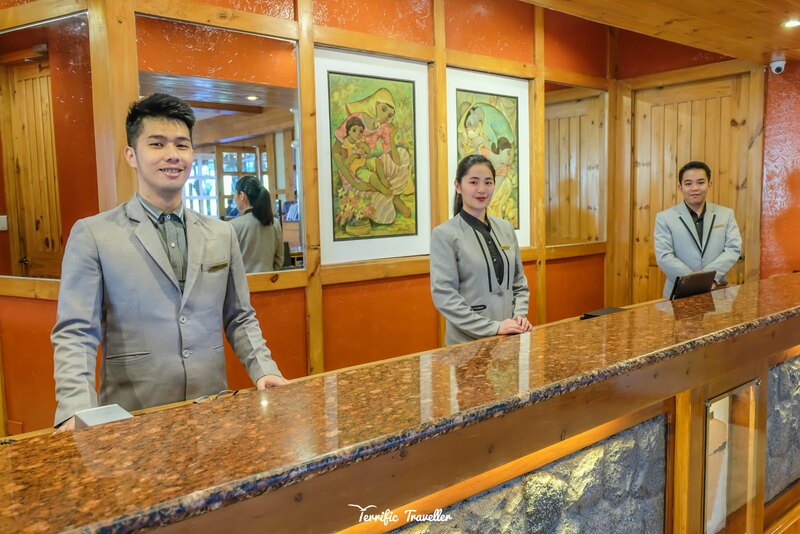 After meeting with Mr. Ross, we then headed to the front desk for check-in, here we were assisted by Joshua from Guest Services, and Team Leaders Caye & Joseph. They were very pleasant to interact with, warm, and very polite. Guests of The Forest Lodge will have to shell out ₱1000.00 per night for incidental deposit – so you won’t have to worry about finding your wallet upon check-out when paying for your midnight cravings in their mini-bar and snack counter in your room 🙂 – still fully refundable if you didn’t avail of any of that craving lol. Joshua then handed our room key, and we made our way up to the 4th Floor, where our One-Bedroom Suite awaits! 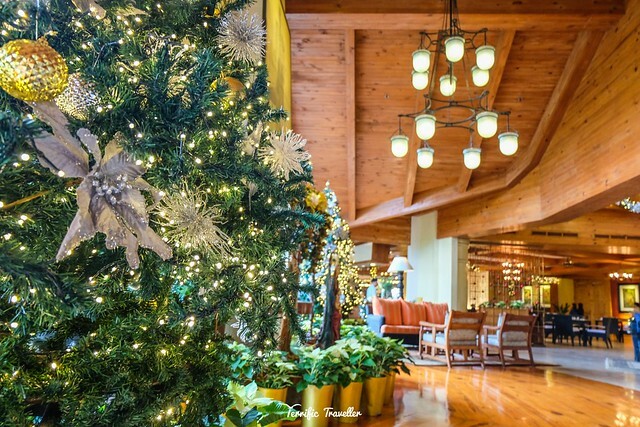 Christmas is really in the air at The Forest Lodge. 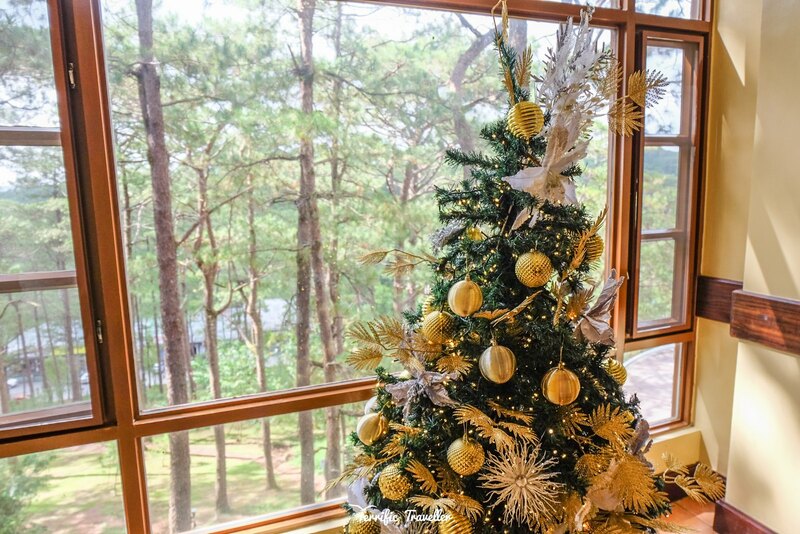 You’ll never be bored even when just strolling along hallways, because you will always be greeted by Christmas Trees at every floor upon entry/exit of the elevators. Trees in, more trees out! Such a beautiful scenery don’t you think? Christmas vibes all around! Head over to the next page to continue our tour.